Vera Tobin's work helps dispel 20th-century Freudian notions that we are made up of many inexplicable facets, that our motives are unknown to us, and that we repress all that we cannot deal with. ... "well-made" by the analogy to the nineteenth-century "well-made play" that mixes the precepts of Aristotle (by way of the neoclassical French Academy) and the popular tropes of the Paris Boulevard theaters to create a heady and reliable formula for crowd-pleasing plots ... their ruling aesthetic is concerned with the degree to which the surprise has been cleverly constructed and set up beforehand. The tradition of the well-made surprise asks, has this revelation been built on an expertly crafted foundation? It places highest value on the satisfactions that come from the sense that the plot is a finely-constructed mechanism, a well-oiled trap, with pieces that snap together tightly. 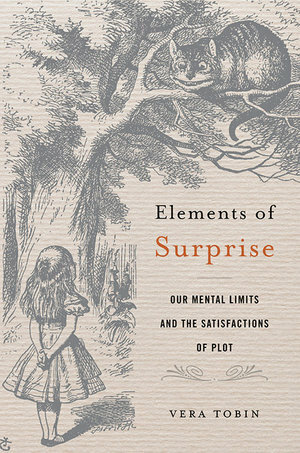 A well-made surprise plot is one that aims to produce a flash interpretation of events together with the feeling that the evidence for this interpretation was there all along — the surprise should be not merely unexpected but also revelatory. With this book, Tobin takes a scientific approach to exploring this kind of surprise in fiction (of all genres.) Specifically, she looks at our cognitive limits and quirks that not only help make such surprises work effectively but also elicit a certain kind of pleasure and satisfaction when revealed, recognized, understood, and acknowledged. She looks methodically under the hoods of various cognitive theories of memory, perception, and narrative linguistics — with all their attendant biases and patterns — as well as several well-known works of prose fiction and film. In addition to readers with an interest in the science aspects, the book should be read by writers who want to improve their craft and readers/viewers who want to understand their own responses to such narratives. Going beyond detective stories, horror and mystery thrillers, and twist endings, Tobin explains how the works of certain writers, from Shakespeare to Ian McEwan, have demonstrated the difference between cleverly fooling/ deceiving readers/ audience versus unfairly cheating them. With the examples Tobin gives fair, early warning that the detailed analyses of these books and movies will result in spoilers for the reader. She takes good care to introduce each example with an overall basic summary so that, if a reader has not read or cannot recall the work, it does not get in the way of understanding the points being illustrated. That said, it would be beneficial to have more than a passing familiarity with the works referenced most frequently or at length: Othello by Shakespeare, Emma by Jane Austen, Great Expectations by Charles Dickens; Villette by Charlotte Brontë; and Atonement by Ian McEwan. There is always a danger, with books packed so densely with theoretical references, of losing the reader's attention or interest. Tobin avoids this by ensuring a tightly-organized structure with only essential theoretical descriptions and frequent easy-to-follow examples interspersed to break up the shop-talk. Also, like a skilled machinist setting up and calibrating his/her tools before starting a run, Tobin takes the entire first half of book — chapters one through four — to lay out all the individual elements. With the second half of the book — chapters five through eight — we get the more complex interplay and combinations of the various elements. An unexpected bonus is that the thorough endnotes make for rather compelling reading too. All that said, this is not a book to be skim-read or finished over a weekend. The consistent, dominant theory underlying all the elements of surprise here is what cognitive scientists call the "curse of knowledge" — a cognitive bias about how we make assumptions, based on our present knowledge, about the knowledge others may have or even our past selves might have had — which leads to errors in our problem-solving and decision-making. Almost the entire first two chapters focus on the "... place and status in storytelling, sense-making, and aesthetic pleasure ..." of this particular bias and much of the second half discusses how it connects with other elements of the well-made surprise. In terms of the basic building blocks for narrative surprise, chapters three and four cover five component strategies — which Tobin calls the "poetics of surprise" — and a number of linguistic patterns. These are the key techniques that enable surprises to unfold and run across an entire story, invoking the curse of knowledge at just the right moments to keep the reader engaged and vested in the surprise. They also help ensure that the surprises are robust and resilient even on rereading. The second half of the book definitely needs to be absorbed relatively slower because of the amount of information and how all the pieces of the surprise puzzle are quickly brought together in varying combinations for different effects. During some parts of this half, it can feel like being rushed, so take your time to pause and digest key points and conclusions before moving along. In the final chapter, Tobin briefly shows how the dynamics of the elements of surprise extend beyond fictional storytelling into other parts of our lives where narrative and rhetoric play big roles because events are presented as stories — for example, fields like law and academia. There is, no doubt, enough material here for at least another entire book. One of the main general benefits of books like this is how they continue to dispel 20th century Freudian notions that we human beings are made up of many inexplicable or hidden facets, that our own true motives are unknown to us, and that we repress all that we cannot deal with. While there is a lot about the human mind we still do not know, we now have a much better awareness of the many levers and pulleys that drive our choices, judgments, pleasures, and satisfactions due to the interdisciplinary study of the mind and its processes. It's fair to say this field of cognitive science is still evolving as new findings emerge when new aspects of our lives are studied through its lens. Probably, the best book on this subject in recent times is Daniel Kahneman's Thinking Fast and Slow (Farrar, Straus and Giroux, April 2013), which characterized two modes of thinking: System 1, the fast, intuitive, associative, shortcut way we use automatically; and System 2, the slow, deliberate, focused way requiring more effort and inputs. The examples I've analyzed throughout this book suggest that at least part of this alchemy comes from something other than the sheer fact that plots present an ordered arrangement of events. It also depends on specific linguistic and narrative structures that encourage us to make inferences — not just retrospectively but also in anticipation — on the basis of viewpointed information, information that is tied to a particular perspective in a particular moment. This means that the impression of inevitability isn't just a matter of consequentialist thinking. It also emerges from modes of thought that are part not only of how we think about the past but also of how we think about other people. Furthermore, the better we understand what makes certain features of a narrative work well, the more it can deepen both our reading and writing enjoyment. One may never aim to be a gourmet chef, but knowing more about the ingredients, recipe, and methodology for how a favorite dish is created adds, undoubtedly, more texture to the epicurean's appreciation of it. It's worth pointing out how Tobin's book differs from the typical fiction-writing how-to book out there. The latter aims to give the writer a grab bag of assorted tools. The danger there is that inexperienced writers do not always know which tools to use, how often, and when. So a lot of trial and error and bad writing often ensues. Tobin's book, in looking at a distinctive aspect of fictional storytelling — the well-made surprise — offers a precise set of tools to be utilized together and in specific ways. This is, in the end, the trick that writers are both subject to and masters of: everything seems simple once you know how the story ends. Sometimes, even with the best-made surprises, a reader may well decode all the cleverly-crafted clues at all the appropriately requisite moments. But such a reader may still be able to step back and marvel at the writer's brilliance for how he/she brought these clues together, assembled them, and presented them with truth, thoroughness, clarity, and precision. Our response to such a writer, whose work is so transformative as to help rewire our own brains and give us new ways of viewing the world, can never be anything short of deep gratitude and respect.